I’ve always promoted making your own personal network safe, and have been recently been working with family members to enable OpenDNS on their own networks, specifically the OpenDNS Family Shield which works great to block unwanted adult content. 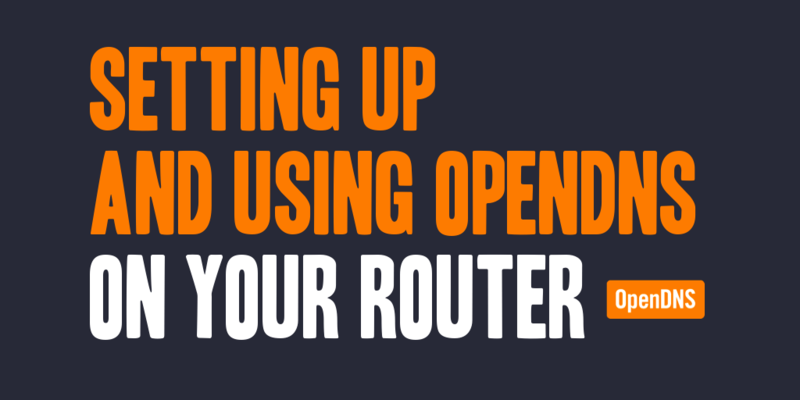 Working with family members to enable OpenDNS on their routers this prompted me to write this post to teach others how to enable the OpenDNS Family Shield on their own networks. This post takes the route of teaching you how to configure the DNS settings used by a router (recommended approach), although it can be configured through your own PC settings, most PCs generally pick up their DNS settings through the router or ISP they’re connected to. 1. Open Your Router Preferences. You’ll need to visit the IP address of your router within a web browser, typically that IP address is 192.168.0.1 (or, you can also type routerlogin.net if you have a NETGEAR router) into the URL address bar of your web browser. Look for the letters DNS in your router settings. This can be on a basic settings page, or in a specific DNS settings page. My router’s DNS settings are located on the Basic Settings page, and appear as shown in the image below. 3. Enter the OpenDNS Servers. Make sure that you specify the IP addresses to use as the DNS servers, typically these are pulled directly from your ISP; and as shown in the image above, I needed to select the ‘Use These DNS Servers’ option to enable me to use specific IPs. Put the following IP addresses into the appropriate locations as directed by your router, and click save/apply. Once your DNS settings have been saved in your router’s settings, it is suggested that you flush your DNS resolver cache and web browser caches to ensure you start using the new DNS settings. NOTE: Want specific instructions for you specific router? Follow this link for further information: Change Your DNS. I’ve been using OpenDNS for a number of years in my home and I’ve been really happy with the service you get. I used to use custom filtering and monitoring with a free account, but it was kind of pain when your IP gets changed so I also am using the Family Shield now.